“Pilgrimage” isn’t the first word that springs to mind when thinking of Tel Aviv. But for a few brave Americans back in 1866, it certainly was. They were 157 men, women and children, all devout Protestants, who left Maine for the Holy Land to help bring forward Redemption. Unfortunately, the harsh Middle East reality soon hit. It took a while for the Americans’ land to be purchased, and many of the pioneers were struck by disease. Within a few years, most immigrated back to America, leaving behind them the pre-fab homes they’d schlepped from Maine. The American homes soon housed another group of immigrants – the German Templers, who added to the colony a small church and surrounding buildings. During World War II, most of the Templers were made to leave Palestine, then under British rule, and the neighborhood fell into disarray. In recent years, the newly discovered architectural gem has undergone extensive renovation, making it a beautiful place for a short tour. Here are a few top spots to explore. Immanuel Church, 15 Bar Hoffman St. Built in 1904 for the German locals, this little church today serves the Protestant community as well as Messianic Jews. The beautiful courtyard and church hall with colorful stained-glass windows offer a welcome respite from the hustle and bustle of the city. On the day ISRAEL21c visited, visitors from all backgrounds toured the church, admiring its architecture and peaceful atmosphere. At the church was the Rev. Juha-Pekka Rissanen from Finland. He’s been in Israel for less than a year and lives in Jaffa with his wife, but previously spent 12 years in the country. Fluent in Hebrew, he explains that there are some 80 community members, the majority of whom are Protestant believers from the area. “We have a classical musical concert every other Saturday night, mostly by professional Israeli musicians,” Rissanen says. There are also occasional organ concerts and a flurry of activities in the run-up to Christmas, making the church a center of culture and music in the neighborhood. Immanuel Church is open for visits Tuesday to Friday, 10-2. Beit Immanuel, 8 Auerbach St. Although it shares a name with the church across the street, Beit Immanuel is an independent entity. Now a guesthouse hosting mostly Protestant pilgrims, the big building has a very varied past. It started out as the Templers’ community hall and a few years later was converted into a palatial home for the German Baron Ustinov –grandfather of actor Peter Ustinov – who then turned it into the fanciest hotel around, Hotel du Parc. So fancy, in fact, that the German Kaiser even spent the night there on a visit to the Holy Land in the early 20th century. Over the years the building evolved to become an English high school for both Jewish and Arab girls, a British police station and even an Israeli army base. 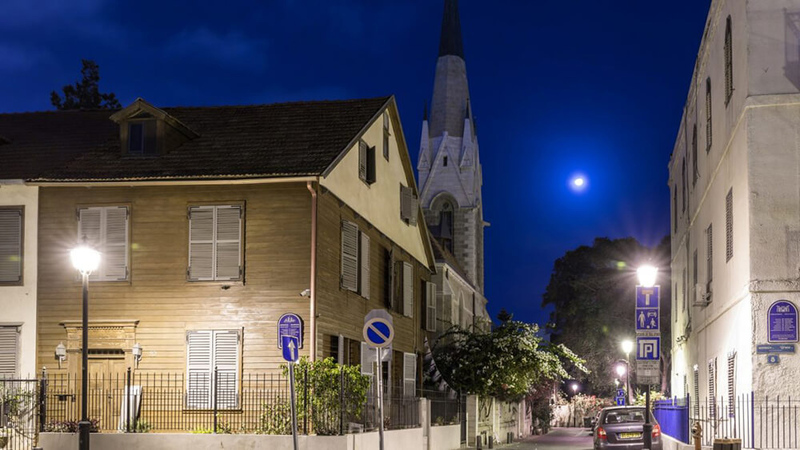 A guesthouse for the last few decades, it belongs to the Church’s Ministry Among the Jewish People and also caters to the local Messianic community. It boasts a beautiful and peaceful walled garden, as a well as a small heritage center about the colony’s history. And the neighborhood has undergone quite a change. “There used to be drugs and bad things going on here. A lot of theft. But nowadays not at all, so the change is for the good, really for the good,” Santos says. The change he mentions is the colony turning from a derelict area on the outskirts of Tel Aviv into an upscale, boutique neighborhood, carefully renovated and restored. An architect by profession, Santos is quite pleased with the restorations, but notes that there’s no such thing as completely turning the clock back. Right by Beit Immanuel is another guesthouse, albeit of a completely different kind. The beautiful stone building was built by original American Colony members, brothers John and George Drisco, and was later bought by a German Templer who turned it into the prestigious Jerusalem Hotel. Twain’s Jaffa residence was to become British military headquarters during World War II, and after the establishment of the State of Israel it was used by the Education Ministry for some time. It stood in disrepair for many years until its renovation and reopening as the boutique Drisco Hotel, named in honor of the brothers who built it. It now offers very plush accommodation, a restaurant and even an underground lounge constructed to resemble a German beer hall. This standout half-wooden, half-stone home is a prime example of American Colony architecture. Built using pre-fabricated wood brought over from Maine in 1866 for the American Wentworth family, it was later expanded to become a home to a German Templer family. The house underwent an award-winning restoration by owners Jean and Reed Holmes in the early 2000s, and today is the site of a small museum showcasing the colony’s history. Maine Friendship House Museum is open Friday and Saturday noon to 2pm and by appointment for groups; +972-(0)3-681-9225.